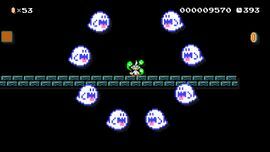 Paranormal Research is an Event Course in Super Mario Maker released on February 4, 2016. It unlocks the Professor E. Gadd Mystery Mushroom costume upon completion. The level begins with two ? Blocks, one of them containing a Mystery Mushroom that turns Mario into E. Gadd. The corridor continues past a Boo, as well as a Dry Bones before heading up to some Hard Blocks, which in turn lead to another ? Block and some Big Thwomps, Boos, and Dry Bones before leading to a warp pipe. More Boos are encountered, along with a few Lifts. Afterwards, three groups of big Circling Boo Buddies are encountered, with the last one guarding a P Door. Mario must then find some hidden blocks to the right, then climb a beanstalk to a P Switch-spawning warp pipe, allowing access to the P Door and the Checkpoint Flag. The next area consists of Lava Lifts and Big Boos on tracks, leading to an area with a single group of big Circling Boo Buddies, which in turn leads directly to a warp pipe. The next segment consists mainly of Stretches, as well as Boos in ? Blocks. This leads to a Lava Lift with a trampoline, as well as a high-up staircase to the Goal Pole. Professor E. Gadd works tirelessly day and night on his studies of spooky spirits. "I fear there may be a new breed of ghost lurking somewhere in this old mansion... Hurry and investigate! You'll have to see for yourself what haunted secrets await." This page was last edited on November 25, 2018, at 14:51.